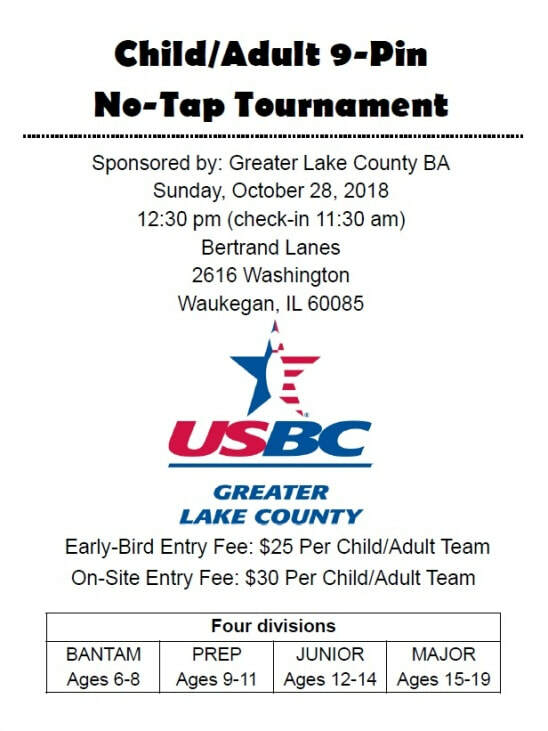 Bertrand Lanes will be the host of this years Child/Adult 9-Pin No-Tap Tournament. This event will be held Sunday, October 28, 2018 at 12:30 pm. and will feature four divisions: Bantam Ages 6-8, Prep Ages 9-11, Junior Ages 12-14 and Major 15-19. Early Bird entry for this event is $25.00 per Child/Adult Team for entries paid for my October 20, 2018. Early entry is encouraged! The entry form for this event can be downloaded from the GLCUSBC website or in your local bowling center.